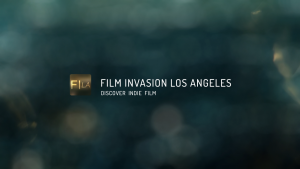 Everyone at Film Invasion Los Angeles would like to thank every filmmaker who was an Official Selection as well as everyone who submitted a film or script. Everyone deserves credit for their great work, but we just have to give out awards. The judges for the Grand Jury Prizes come from the festival’s selection committee and board members. The Filmmakers Awards are given for the Narrative Short category and are selected by the Filmmakers Board, a panel of twelve peers whose films have been Official Selections previous years. It’s the last night of Film Invasion Los Angeles and we have ten incredible movies for you to enjoy. Today features a little bit of everything… but always original. If you love Comedy, Drama, Science Fiction, Star Wars, then you really should come out and show these talented young filmmakers your support. You can quite literally Meet Tomorrow’s Filmmakers Today. 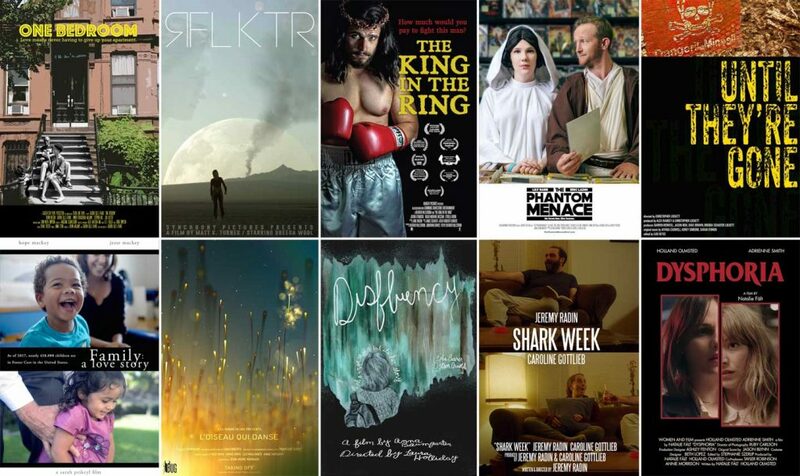 Last night we watched 9 wonderful movies together… and TONIGHT there are 9 MORE! 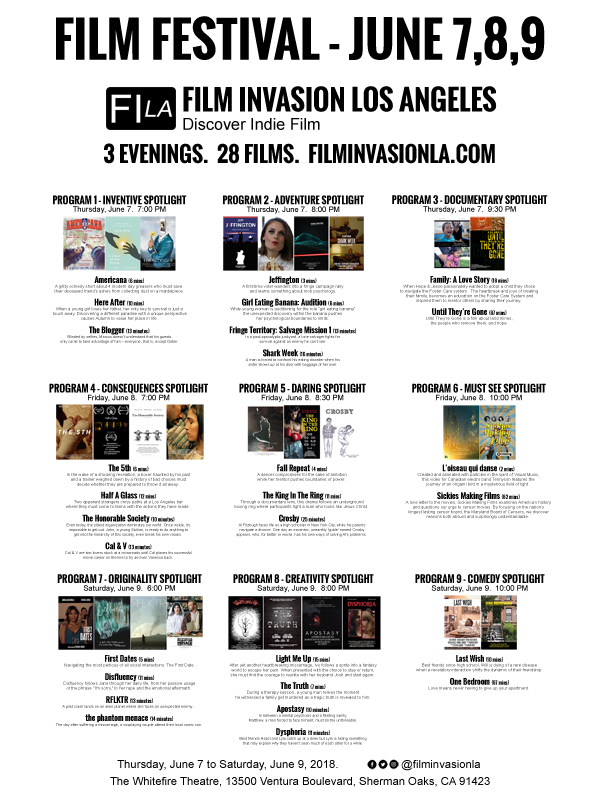 If you have ever said, “I don’t bother going to the movies because all Hollywood puts out is boring sequels and hacky formula,” then you should come to Film Invasion Los Angeles TONIGHT! We’ve got Drama, Thrillers, Love Stories, Tragedies, Triumphs, Imaginary Friends, Dazzling Digital Effects, a Music Video you won’t believe… and we wrap it all up with a documentary made especially for movie lovers! Have you ever said, “The Hollywood studios only give us superheroes and sequels.” Then you should come to Film Invasion Los Angeles TONIGHT! Do you like Comedy? Documentary? Action? Drama? 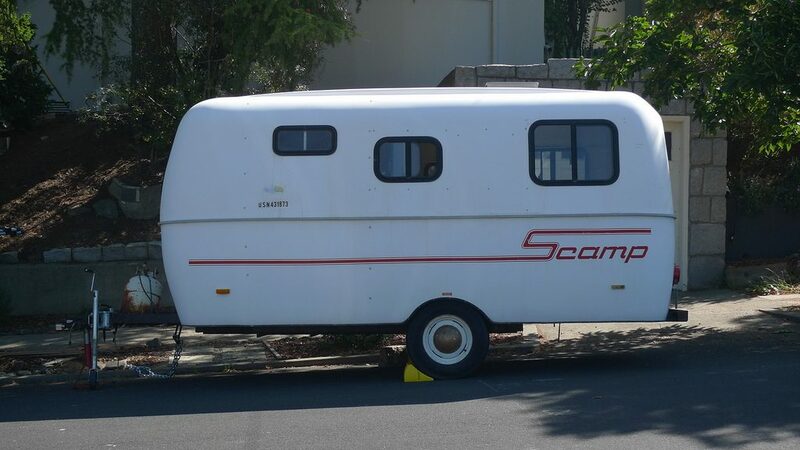 Sci-Fi? Satire? Social commentary? A little bit of everything is playing tonight. The FILA 2018 Official Poster is in the window of the Whitefire Theatre. Why not share it online as well? The poster features every poster of every film screening this year, along with their title and logline. At 3-feet by 4-feet, we can’t wait for everyone to see it in person. You can click on the image below to launch the full size in a new tab. Film Festival Trailers are Up! The trailers are up! 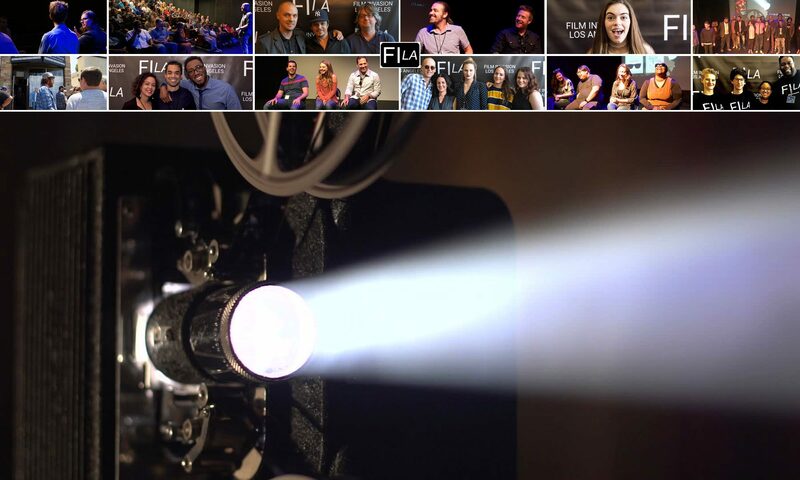 Check out our film festival trailers page to see a trailers with clips from every film playing at the festival this year as well as trailers for most of the films showing. At the bottom of the page we even have trailers for each day of the festival.